TowBoatU.S. Endurance is primarily used for our containment boom operations. 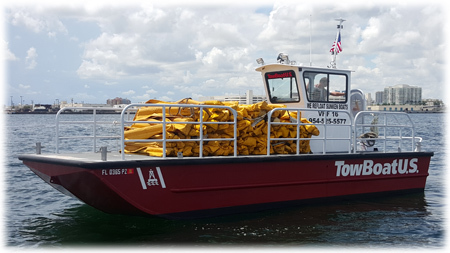 Due to the The vessel's large cargo area, we are able to transport, deploy and recover over 1,800 feet of Containment Boom. Please click here for a copy of her survey. The vessel is available for hourly and daily charter for use as a work platform for a wide variety of projects. Content Copyright © 2016 Offshore Marine Towing, Inc. All Rights Reserved.